Hans Ullrich Bitsch side table Series 8600, circa 1980. Postmodern classic with black metal table top and highly delicate metal joints. Good original condition with minor wear, some scratches on the black top and color losses. 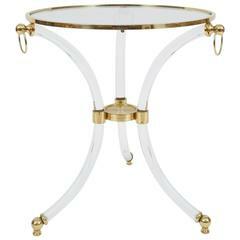 Elegant round glass side table with bent solid lucite legs and polished brass details in excellent condition. 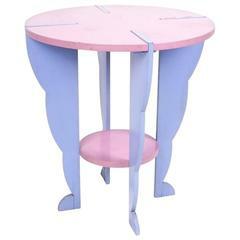 Diameter is 23.22" / Height 24"
JH 800 - side table with slate top and frame of steel. Maker Johannes Hansen. Pair of 1980's metal pedestal side tables with heavy round glass tops. 1980s lacquered geometric side table with drawer. Needs to be re-lacquered.